Washington D.C., April 20, 2018 – Back-channel diplomacy, conducted by an ABC News reporter named Lisa Howard resolved a potential crisis with Cuba in mid-1964, according to documents posted today by the National Security Archive. After the CIA obtained “disturbing” intelligence reports that Fidel Castro had threatened to shoot down U.S. reconnaissance planes in retaliation for the Coast Guard seizure of four Cuban fishing boats, Howard secretly traveled to Cuba to convey a U.S. government warning to Castro, and returned with his assurances that “nothing will happen to our planes, and that we do not need to send him any warnings” – a message passed through UN Ambassador Adlai Stevenson directly to President Johnson. 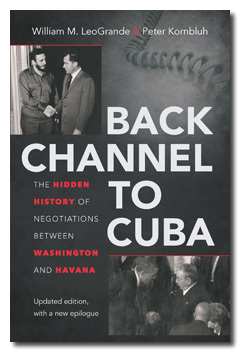 A comprehensive historical account of Howard’s extensive involvement in back-channel diplomacy with Cuba was published today, for the first time, in Politico Magazine in an article by Archive analyst Peter Kornbluh – "My Dearest Fidel: An ABC Journalist’s Secret Liaison With Fidel Castro.” The article is subtitled: “The untold story of how Lisa Howard’s intimate diplomacy with Cuba’s revolutionary leader changed the course of the Cold War.” The Archive today posted a selection of Howard’s personal papers and documents on which the article is based. Lisa Howard, a former soap opera actress who transformed herself into one of the leading female television news correspondents in the United States in the early 1960s, first met Fidel Castro when she convinced him to do an ABC News interview in April 1963. Howard was the first woman to anchor a television news show – “Lisa Howard and News with a Woman’s Touch.” Her two ABC specials on Cuba, “Fidel Castro: Self Portrait” in 1963 and “Cuba and Castro Today” in 1964, provided the most substantive coverage of Castro and the Cuban revolution in the early 1960s. 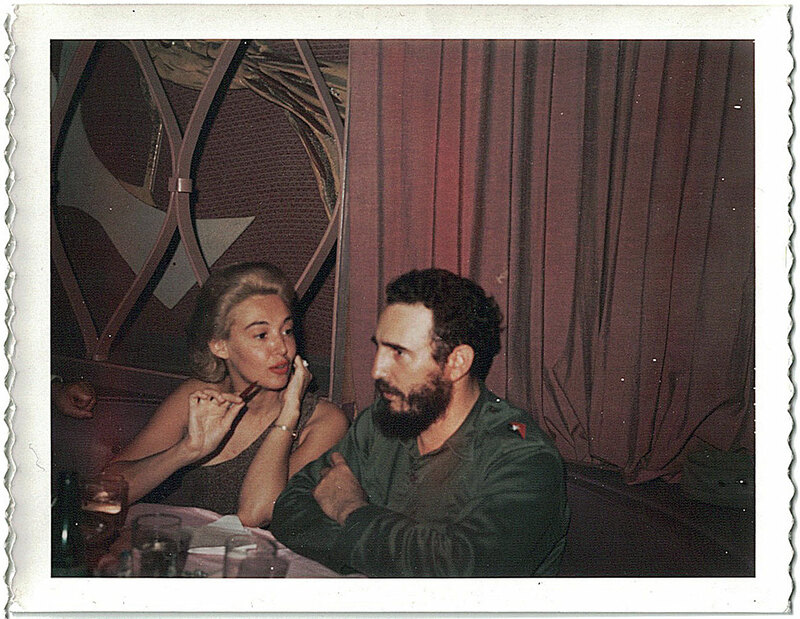 Off camera, Howard became the central intermediary between Castro and the Kennedy administration in the fall of 1963, turning her home in New York City into a hub of secret diplomatic communications between Washington and Havana. After Kennedy’s assassination, she and Castro collaborated to revive the secret dialogue and establish a back channel to the Johnson White House. According to Kornbluh’s Politico article, “her role as peacemaker was built on a complex, little-understood rapport she managed to forge with Castro himself – a relationship that was political and personal, intellectual and intimate.” She died at age 39 in 1965. “With her tireless efforts to achieve an honorable rapprochement with Cuba,” according to Kornbluh, “Lisa Howard set the historical stage for the breakthrough in relations more than 50 years later under the Obama administration.” The records of those efforts, he noted, are once again relevant as Raul Castro steps down as president and the Trump administration weighs future U.S. policy toward Cuba in the post-Castro era. Lisa Howard's promotional brochure from 1963. 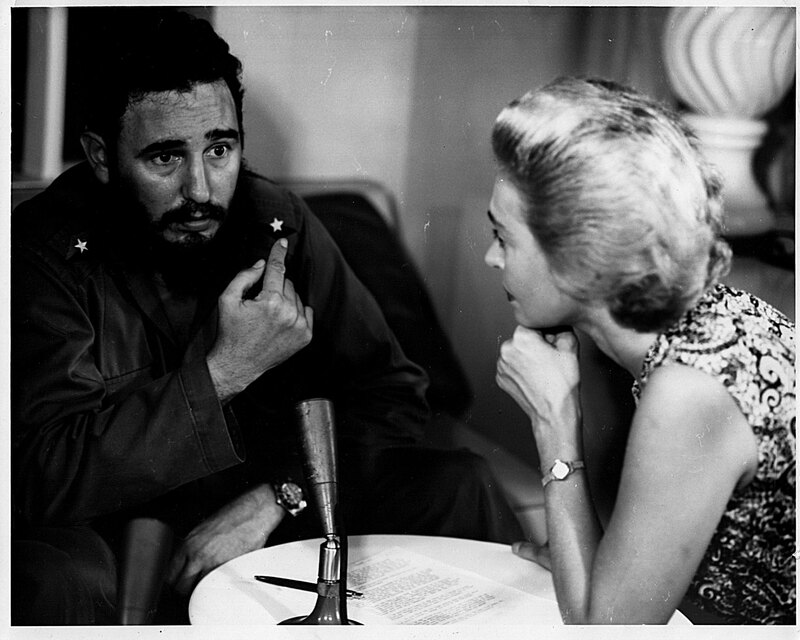 Lisa Howard interviewing Fidel Castro, April 23, 1963. 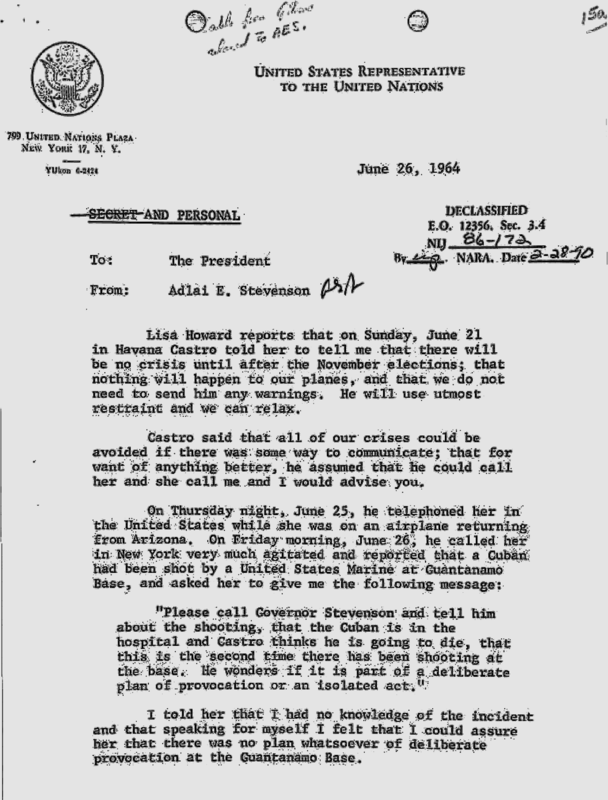 UN Ambassador Adlai Stevenson conveys a key message from Castro, via Lisa Howard, to President Lyndon Johnson. The information resolved U.S. concerns Castro might create a crisis by firing at U-2 reconnaissance planes during the 1964 campaign.